Get Your 30th Century Fix! "Fry and the Double-Bag Must-Have Item" is the thirtieth comic issue, which was released 28 March, 2007 in the US. Fry, Leela, and Bender make a delivery of a slabbed Barry Bonds to a man named Grabby, who has an incredibly interesting collection mainly of baseballers, that are sealed in mint condition for all eternity. Grabby reveals that in his comic collection he does not have Space Boy #150 of which there are no more copies, and he would pay a fortune if anyone gave it to him. Bender attempts but fails to steal some of Grabby's possessions. Back on Earth, Bender attempts to draw a version of Space Boy #150 so he can sell it and Fry reveals to Bender and Leela that he once owned a copy. Upon hearing that he stored it in Panucci's Pizza parlor, now buried in Old New York, Leela, Bender, Zoidberg and Fry go into the sewers in search of the artifact. After a while they find Panucci's Pizza and amazingly, Fry finds his comic book in mint condition which was hidden in the men's room from his brother. He puts it for auction on IdBay, and Grabby wins the auction against an anonymous bidder. On the way to Grabby's home planet, Fry and Bender argue over who gets the comic until the crew are attacked by Mom who was the anonymous bidder and her sons. Mom wants the comic for the plastic that kept it in mint condition for a millennium so she can clone it and make billions. Mom gives the comic to her sons who tear it up fighting over who should get it. This ruins Fry's chances of becoming a billionaire. This is the first issue written by Len Wein. Amy mentions a cousin Marsha. This is the second time Mom has taken a fortune from Fry, the first being "A Fishful of Dollars". Similarly, in "Who's Dying to Be a Gazillionaire? 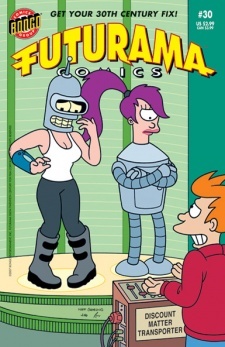 ", Fry became ineligible for the game show's prize money after Mom briefly took ownership of Planet Express. Panucci's pizza is no longer in Old New York and has been a museum piece since "Jurassic Bark". The note on the pizza seems to imply that Panucci's son was supposed to deliver the pizza.